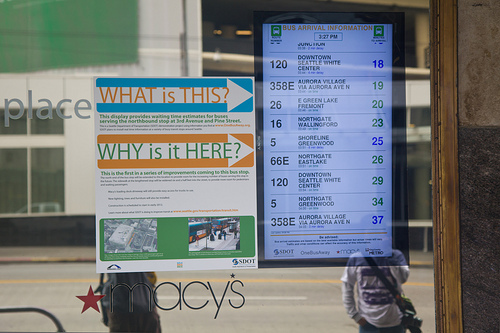 OneBusAway provides a mode optimized for showing real-time arrival information on large public screens, allowing quick and cheap information displays. title=... - By default, the sign uses the current stop name as a title. This option allows you to override the title. showTitle=false - Alternatively, you can hide the title completely. route=X_Y - Specify a route id to indicate that only this route should be show. Can be repeated. minutesBefore=N - Excludes vehicles that departed more than N minutes ago. minutesAfter=N - Exclude vehicles arriving more than N minutes from now. refresh=N - Automatically refresh the page every N seconds. Copyright © 2018 OneBusAway. All Rights Reserved.